To understand the inner workings of the “accumulation by dispossession” regime, we would have to focus our analysis not only on macroeconomics, negotiations, elections, referendums, protests and other spectacular events, but also — and especially — on the micro-level of everyday life in the city. The urban space is always a crystallization of broader relations of power; it is constantly formed and reformed by political and economic powers to ensure the control of the populations inhabiting it, facilitate their exploitation or exclusion, and constrain their possibilities of empowerment. The urban space, however, can also become a place of coexistence — a place where social bonds and communities are formed, where commons emerge. Ultimately, it can become a place of resistance and self-determination, a place of inclusion; inclusion not only in the sense of formal rights granted by an instance of power, but in the sense of full participation of all different identities and subjects in political, economic and social life. Land grabbing, useless infrastructure works, gentrification and urban renewal, commodification of basic human needs such as housing, food, water and healthcare, evictions and displacement, xenophobia, militarization and increased surveillance are central elements of the policies of dispossession, implemented within the urban space at the expense of the popular classes. Resistance to these policies comprise a mosaic of struggles for a “right to the city,” conceived not as a guarantee of individual resources or opportunities, but as an affirmation of the collective self-determination of everyday life. To make sense of the urban struggles that have proliferated in Greece since 2008, we should understand the process of formation of Greece’s cities in the second half of the twentieth century. Greek cities burgeoned in the 1950s when rapid industrialisation combined with the destruction and animosity left behind by the Civil War (1946-1949) drove rural populations to the urban centers. Lax planning laws, along with a legal arrangement that allowed small property owners to erect high-rise buildings — ultimately at the benefit of constructors and their political patrons — are factors that determine the urban landscape to this day. These developments represented an initial process of enclosure that eroded traditional communities, commodified housing and promoted a peculiar form of “isolation among the crowd of others.” City centers and popular neighborhoods are to this day characterized by high population density, narrow streets and a lack of open spaces and public facilities. In the “feel-good” decades of the 1990s and 2000s, a debt-fueled “affluence” drove the middle classes towards the suburbs. Meanwhile, gentrification efforts were underway, culminating in the “construction frenzy” of the 2004 Athens Olympic Games, when extensive urban renewal projects created more opportunities for accumulation for elites, while promoting displacement, exclusion, repression and surveillance for the urban poor. 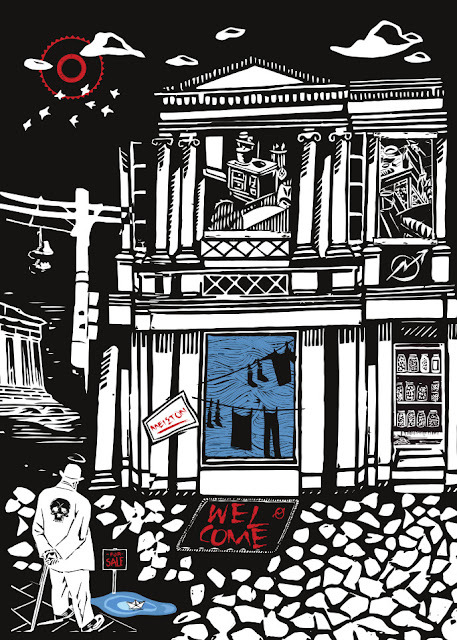 Struggles for reclaiming the urban space took place prominently in December 2008, when the cold-blooded murder of a teenager by the police sparked a month-long revolt which spread like a wildfire throughout the country. High-school and university students, immigrants and the disenfranchised urban youth took the streets protesting the urban alienation, exploitation and exclusion that hid underneath the façade of prosperity. The different identities of the participants were fused in a collective “anonymous” subject that began, as the revolt progressed, to actively transform the city through decentralized — often symbolic — acts of re-appropriation of urban space, such as occupations of public buildings, barricades, marches, impromptu dance and theater actions in the streets, the interruption of official events and disruption of traffic and commercial activity. A distinctive feature was the absolute lack of formal demands; the protesters were not fighting for rights or reforms, but for the opportunity to live with dignity and self-determination, to connect their desires with reality. While this was a landmark event, we should beware not to idealize the December revolt. Despite the fusion of identities, the violent and spectacular nature of the protests privileged one specific form of identity — young, fearless, able-bodied males — and prevented the creation of spaces of inclusion for people of other social categories — families, the middle-aged, immigrant women — who may have had as much of a reason to be angry. Nevertheless, the collective “scream” of December 2008 was a wake-up call for a dormant and complacent society, and it has left a legacy of social cooperation and a redefined public sphere. Thousands of collectives were born, from political groups to art ensembles to grassroots trade unions. A whole new generation of politicized youth was schooled in horizontalism, solidarity and direct action tactics, and new spatial practices were adopted by social movements, culminating in the propagation of self-managed squats and social centers to all corners of the country. Navarinou Park, for instance, is part of the legacy of December. 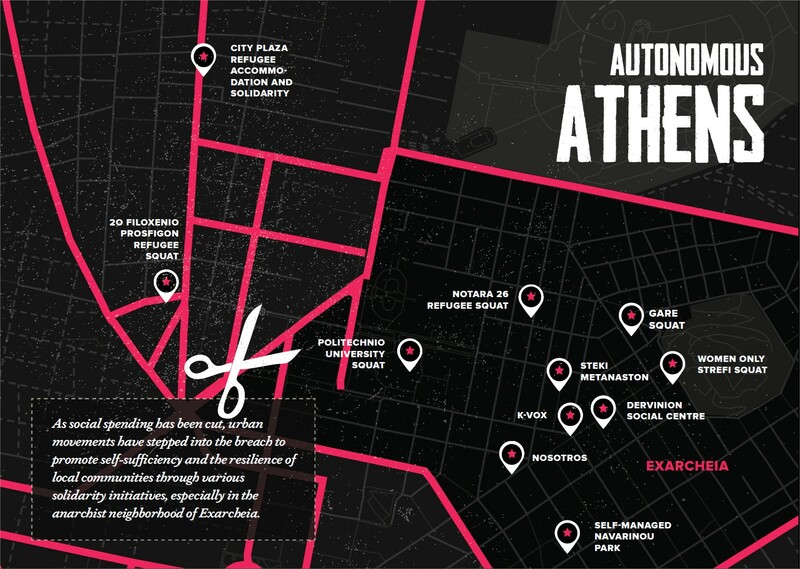 Only a few months after the revolt, an abandoned parking lot was dug up in Athenian neighborhood of Exarcheia to be transformed into a park, self-managed by neighbors and collectives and available for cultural and social events. Despite attempts at eviction, the park retains its character to this day. Even if the vocabulary of the commons was not widespread at that moment, Navarinou represented an early instance of the substitution of “public” space with “common” space; of rigid, aseptic space that serves as a neutral ground between isolated individuals with organic space where individuals can connect and intertwine their desires in the context of the community, where they can negotiate the terms of their co-existence. This kind of urban commoning, previously confined to the spaces of the libertarian movement, would go on to become a blueprint for urban struggles in the following years. The “debt crisis” that erupted in 2010 only served to intensify existing social antagonisms, and consequently exacerbated conflicts over urban space. While elites and the mass media were trying to drag the population into a collective guilt trip over “living beyond their means,” a massive operation of social engineering was set in motion, designed to dispossess and exclude the bulk of the population. All state assets and infrastructure went up for grabs to the highest bidder; the wages, pensions, labor rights and welfare arrangements of the popular classes were slashed overnight; a recessionary spiral would destroy the country’s productive backbone and create unemployment and misery; unjust regressive taxation and rising household debt offered the coup de grâce. Dispossession policies revolving around the workplace were met with resistance against the devaluation of labor power, but the paradigmatic conflicts of the crisis era take place in the urban space. The spatial narrative of the neoliberal state always involves a “backwards” population which should be “ushered into the civilized world.” The state poses as a force of “rationalization,” which extends its control over the city and combats “submerged” and “informal” practices in order to bring the totality of the population under the rule of law. The reality, however, is quite different. In a context of injustice and popular anger brought about by neoliberal restructuring, the role of the state is to contain resistances, enforce the ongoing processes of exclusion and maintain social peace by any means. Interestingly, while the Greek state employed many “formal” repressive practices — increased surveillance, judicial persecution of social struggles — it largely resorted to “informal” avenues. Examples include brutal crowd control techniques, systematic framing, beating and torture of activists by the forces of order and, most prominently, new techniques of spatial control by proxy. One such technique is the collusion of the police with the neo-Nazi party of Golden Dawn to overtly “besiege” the city. Golden Dawn first emerged in the public spotlight when they hijacked a “citizens’ committee” in the working-class central Athenian neighborhood of Ayios Panteleimonas, using it as a vehicle to impose an “ethnic cleansing.” Immigrants were violently attacked and expelled from the area by violent mobs, solidarity marches protesting the siege were teargassed by riot police, even the playground in the central square was locked and guarded so it was not used by immigrant families. As we are presently witnessing throughout the Global North, perceived threats to a society’s stability may activate reactionary and xenophobic reflexes. Through carrot-and-stick tactics, Golden Dawn took advantage of the collapse of the two-party system that had predominated since the 1974 transition to democracy. On the one hand, it cultivated a “Robin Hood” image by organizing food hand-outs and blood donations “for Greeks only” — a perverted and exclusionary kind of “commoning.” On the other hand, it began a reign of terror, with neo-Nazi death squads patrolling the streets in many neighborhoods and attacking anyone looking “undesirable” —anyone looking like an immigrant, a homosexual, a transsexual, a radical and so on — with the blessing or the direct participation of the police. The xenophobic campaign lasted several years, and it left hundreds of victims. It was only after the murder of anti-fascist rapper Pavlos Fyssas and the subsequent intensification of decentralized antifa tactics by social movements that the streets could be reclaimed. Under popular pressure, the state decided to “put a leash” on its erstwhile allies. A similar kind of “spatial control by proxy” has been implemented in the case of Exarcheia for a long time now. The police actively pushes organized drug-dealing gangs towards the area, long an urban stronghold of the anarchist movement, in an effort to erode the radical collectives and communities that populate it. As a result, heroin trade runs rampant, anti-social behaviors are frequent and ruthless mafias rule their “territory” with an iron fist. Recently, anarchist groups decided to take matters into their own hands and push the gangs out of Exarcheia by organizing self-defense militias to patrol the neighborhood. While it is too early to say whether it has been successful, this is an immensely complex endeavor, as the direct questioning of the state’s monopoly of violence raises thorny questions related to the social legitimation of the militias, collective responsibility and reasonable use of force. In the light of the above examples, the idea that the neoliberal state is an agent of “rationalization” that combats submerged and informal practices is discredited. Rather, the state has the power to decide which informal practices will be tolerated or even promoted and which ones will be persecuted, according to its current tactics. As the crisis deepened, a moment that defined grassroots politics in Greece was the occupation of the squares by the “indignants” from May 2011 onwards, at the same time as the Spanish 15M movement. A multitude of individuals with different origins and agendas — according to some statistics, one out of four Greeks — participated in the occupations and assemblies. This diversity was certainly an advantage, as it enabled osmosis between different groups and individuals and the emergence of innovative initiatives and practices. Nevertheless, the — minoritarian — presence of nationalist discourses and the absence of “class” as an analytical framework drove some radical activists away from the squares. Despite any discrepancies and the admitted difficulty of the indignants to self-identify as a “movement,” the influence of the squares regarding spatial practices and the production of the urban commons has been crucial. In the wake of the squares, a multitude of local neighborhood assemblies emerged. Their priorities were no longer to influence developments on the central political stage, but to self-organize and defend against the impending attack on popular living standards — to promote self-sufficiency and the resilience for local communities, filling the gaps left behind by the retreating welfare state, and to combat poverty and unemployment through the promotion of solidarity endeavors. In the context of urban commoning promoted by neighborhood assemblies, occupation practices acquired legitimacy and became widespread. It was no longer just youthful protesters who occupied public spaces to turn them into commons, but mixed collectives of young and old, men and women, families and individuals, immigrants and natives. These practices are exemplified by the occupation of urban land to turn into self-managed, community-run vegetable gardens. Such is the case, for example of PERKA (“Peri-urban Farming”) in Thessaloniki and the Self-Managed Urban Gardens of Elliniko in Athens, on the grounds of an abandoned military base and the former Athens airport respectively. According to the terms of the memorandum of understanding between the Greek government and the Troika of foreign lenders, both sites are earmarked to be privatized and developed into luxury housing and commercial infrastructure. In both cases, broad citizens’ movements demand their conversion into metropolitan parks with public facilities instead. Local community self-defense initiatives multiplied when the government imposed a regressive land ownership tax — mockingly called haratsi, for its reminiscence of a despised Ottoman poll tax — arbitrarily charged through the electricity bill. Homeowners who failed to pay the tax were having their power cut off; that was quite common in a country where wages had been slashed and one third of the workforce was out of a job. This sadistic measure would have created a situation verging on humanitarian catastrophe, were it not for the self-organized “anti-haratsi” neighborhood committees, which would be on call to extra-legally reconnect the power for families that could not afford the tax. Food provision was another important area of self-defense. In the previous decade, food distribution had been captured by oligopolistic, price-fixing middlemen, who made everyday staples unaffordable for the popular classes, while squeezing the profit margin of food producers. The movement to cut out the middlemen started with truckloads of potatoes arriving in central city squares to be sold directly to end consumers. The “potato movement” soon evolved into a decentralized “guerrilla farmers’ market” movement, which occupied urban land without permits, trying to bring together farmers and consumers despite the threat of eviction, arrests and confrontation with entrenched interests. The creation of “urban commons” extended to healthcare, with the creation of an extended network of self-managed solidarity clinics; alternative currencies, notably TEM in Volos, Syntagma Time Bank in Athens, Koino in Thessaloniki and two dozen more; consumer cooperatives, such as Bios Coop in Thessaloniki, which unites more than 450 families in reclaiming their food autonomy; solidarity kitchens, which offer free or very low-cost food, encouraging punters to get involved in cooking and food distribution; and a multitude of egalitarian workers’ cooperatives, mainly concentrated in the services sector, such as those belonging to the Athens Network of Worker Cooperatives. WHAT KIND OF “RIGHT TO THE CITY”? In a country as puritan and religious as Greece, the importance of “visibility” events like the Gay Pride March or the Naked Bike Ride in reclaiming public space for the full spectrum of identities and alternative practices cannot be overstated. Indeed, these events regularly become sites of confrontation with the Orthodox Church or the extreme right. These events, however, face an additional risk: to the extent that they promote an individualistic conception of the “right to the city” and fail to adopt an intersectional view of social oppression, they may involuntarily turn themselves into a “niche market” in the context of urban renewal, under which diversity is prized as long as the overriding social principle remains that of market exchange. Indeed, “diversity”, “creativity” and “innovation” are the core concepts of gentrification processes that are underway in most European cities. These exclusionary processes presuppose an individualized consumer of rights, rather than active collectives that affirm their right to self-determine everyday life in the city. To address all these oppressions at once, Radical Pride, an “alternative” gay pride event that preserved its autonomy from public institutions and corporate sponsors, was organized in Thessaloniki this year. Radical Pride offered a rich framework to understand how gender, race, class, sexual orientation, ethnicity, age or ability intersect in the production of oppression and exclusion. It thus sought to affirm collective action and connect the struggle of the LGBTQ movement with other urban struggles. Indeed, in the recent conflict around refugees, xenophobic “residents’ committees” have played a dubious role by protesting their inclusion in social life. Likewise, the state treats the plight of refugees as an issue of public order and tries to keep them isolated in deplorable conditions in camps, away from urban centers. As a response, solidarity movements have patiently set up solidarity structures to include refugees in the social life of the city. The pinnacle of these efforts are the self-managed occupied refugee shelters that have been created in Athens, Thessaloniki and other cities — several of which were evicted by the police last year. By 2013, the construction of Syriza’s hegemonic project was advancing at full steam. Hardly any movement remained unaffected by the party’s desire to pose as the political expression of anti-austerity struggles and monopolize the concept of solidarity. Today we are experiencing the end-result of this process: policies of dispossession are intensified under a nominally left-wing government, while resistances have been neutralized, and “social peace” — much desired by international and local elites — has been secured. This defeat, however, is not the work of Syriza alone but also demonstrates the internal limitations of the movement. While in Spain, for instance, the desire of people for institutional change was largely channeled to the local level and towards coalitions hegemonized by the movements themselves, in Greece, the dual influence of, on the one hand, the anarchist movement, which is hostile to any kind of involvement with the institutions, and, on the other hand, a rigid parliamentary and extra-parliamentary left, which in its statist mindset fails to perceive the importance of local participatory forms of government, prevented the emergence of independent municipalist initiatives. In 2014, municipalist observatory dimotopia.gr (now defunct) identified 17 independent municipalist formations that had direct democracy as a central element of their program. A couple of years later, few had managed to gain representation. Many secured the support of Syriza; this gave them an electoral push, at the expense of gradually being taken over by professional politicians and losing their grassroots character. One such case is the formation “Resistance with the Citizens” in the Athenian municipality of Chalandri. After spending a long time as a minority opposition party, it conquered the mayorship in 2015. Two years later, many of its long-time members resigned, denouncing the new mayor for transgressing the foundational principles of the formation and aligning himself with the government’s austerity policies. It is very early to say whether the municipalist movement in Spain has had any significant influence on institutional politics — strong debate and criticism has been generated on this question within the movement itself. We can, however, argue that in Greece, the deficit of grassroots political coordination — electoral or otherwise —facilitated the continuation of austerity policies. While the suspicion of great parts of the movements towards electoral politics is understandable, in no case should this be translated into reluctance to organize, cooperate, compromise, scale up, reach out to society, participate energetically in the public dialogue. There is no merit in partiality, marginality or ideological purity. The first few years of the crisis brought a profound delegitimation of the political system and its satellites — political parties, trade unions, the mass media — as well as the dissolution of identities formed around social status, work or consumption. This produced not only depression and resignation, but also an explosion in grassroots mobilization that affected the lives of many and created structures, collectives and practices to reclaim the city for a diversity of subjects. At the peak of these mobilizations, there was widespread optimism that the mere accumulation of urban commons would be enough to radically change the urban landscape and create a social counterpower sufficient to effectively challenge the processes of dispossession. In the following phase, grassroots movements were faced with the inevitable question of political coordination and institutional change, and were called to position themselves with respect to the hegemonic project developed by Syriza. Some identified with the project and were assimilated by it; others adopted a cautious but pragmatic position, trying to negotiate political benefits without compromising their identity; others still denounced Syriza’s project and distanced themselves from it, but without producing an alternative form of political coordination. This was a time of intense conflict and debate. In the present phase, hopes of institutional change have been dashed, grassroots movements have lost their mass character, and remaining collectives have entered a process of reflection and redefinition of strategy. One key point to highlight in such reflections is the importance of grassroots urban struggles during the crisis, taking into account not only the external threats they face — repression and co-optation — but also their internal limitations: their contradictory nature, their ideological divergences, their difficulty in finding a common vocabulary, in coordinating and in forming a coherent political subject. These shortcomings, however, should not be perceived as a failure, as the cycle of dissent and subordination is never a zero-sum game. There is an “overflow” that persists and forms the substrate of the following cycle of mobilization. This overflow includes ideas, practices, values and possibilities of action that did not exist just a decade ago, in addition to a new voice in the public discourse, which prioritizes social cooperation and self-determination.